Think ahead and plan the shortest and safest way to your destination. Wear light colored clothes at night to ensure your visibility to the vehicle driver. 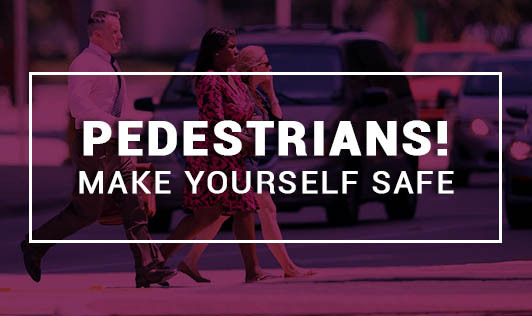 Follow these six steps while crossing the road. THINK-Is this a safe place to cross? Can I see all the traffic properly? Make sure you are not hidden behind a parked car. STOP- At the edge of the road where you have decided to cross. LOOK & LISTEN- To see if there is any traffic coming, look both ways, many times. WAIT- For road to be clear and all the traffic to pass. CROSS-Walk straight across the road. DO not cross diagonally. KEEP LOOKING & LISTENING- Keep looking as you cross the road until you get to the other side.